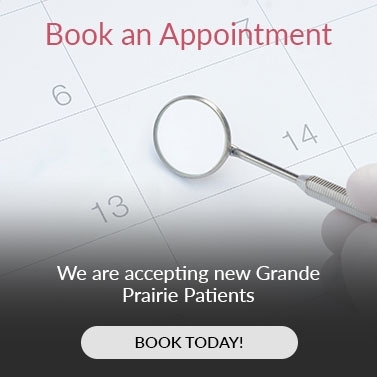 Our Grande Prairie dentists offer oral surgeries including tooth extractions, wisdom teeth removal, and root canals to patients with affected teeth. The Prairie Mall Dental Clinic has been open since 1997. If you need a dental care provider who performs oral surgeries in Grande Prairie, rest easy. The Prairie Mall Dental Clinic provides general dentistry and oral surgery services to your area. Our clinic also offers cosmetic and restorative dentistry to residents of Grande Prairie and the surrounding areas. Such services work for both routine and immediate dental issues. Learn more about our surgical services below. When a tooth or its pulp is infected, the nerve within the pulp may die, which can cause the tooth to die. A root canal procedure involves the removal of the infected pulp in order to salvage the tooth. After the procedure, a crown or filling may be used to restore the look of your tooth. If you have impacted wisdom teeth, it may cause you pain, discomfort, infection and even decay. Cysts can form around the tooth, which can endanger your dental health. Undergoing a wisdom tooth extraction is the best way to combat this possibility. Most people enjoy routine dental check-ups and cleanings. By following a pattern of regular dental treatment, you can prevent many problems—like cavities—from developing. However, some oral health issues require more extensive services. Whether you have an oral disease or other similar problems, let us help. Surgery doesn’t have to be scary, and you can avoid a difficult recovery by getting this treatment early on. Tooth removal represents just one common reason for oral surgeries in Grande Prairie. The staff at Prairie Mall Dental Clinic also uses oral surgery to treat conditions such as advanced gum disease, gingivitis and other oral issues. Oral surgery eliminates and prevents serious problems in your mouth. We highly recommend not postponing your consultation. Take responsibility regarding your dental health and ask your dentist if oral surgery represents the right solution for you. When people need oral surgeries in Grande Prairie, they also should consider recovery time. Prepping, conducting procedures and post-op recovery are all important steps in the process. So if you need to take time off work, schedule extra time so you can heal at your own pace. The recovery after a surgery matters just as much as the procedure itself. To heal quickly and properly, exercise post-surgery awareness. This process involves proper administration of pain medication and oral cleanliness.